Sounds great, how long does it take for a card payment transaction to be credited to your bank account? This will depend on your Merchant Agreement – typically a few days. You can use your existing card deal if you like, we can hook it into the payment gateway. please include auburn house in the fab pay launch. I have found using freetobook a really good system which has helped us in guesthouse operation. I have been looking at the system of Fabpay, however I am already tied into a 36 month contract with Payment Sense. I cannot see how this system would be any cost saving so perhaps you could assist. I have looked at the blog and it seems that there is four payments to be made associated with this method 1.35% plus 8p, plus 24p,plus 22p. Any help you can provide would be appreciated as we have had customers who have booked elsewhere due to the only payment method being paypal. Do we need to be using Sage software ourselves to use this? The SagePay gateway is integrated into the freetobook system it is included in FabPay so you won’t need to do it yourself. FabPay Priority in the subject line. Currently use Elavon merchant account, €15.00 per month and 1.7% on viva / Mastercard while 2.5% on American Express. I know there are free systems like Stripe and sumup but I dont like system where you key clients card details into computers or phones much perfer old fashioned terminal think most people thrust them. I hope your system will offer chip & pin / swipe facilities also. Fab pay looks good – I would like to link it to my already installed Freeto book. I am interested in fabpay , I currently use paypal which has been ok except I do not take phone payments with this . You will be able to take phone payments with FabPay using a virtual terminal. I have been using Paypal and find it time consuming. Having to send invoices for final payment and transferring funds to my bank account. I have been looking at other options, but they have been so expensive. This sounds ideal. Hi, Will we be able to use FabPay for face to face transactions? 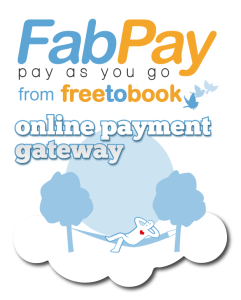 We love freetobook, it’s brilliant and hope to be using fabpay before long. Yes, you will be able to type in the details while logged into freetobook. The payment will then show against the relevant booking. I don’t have card payments just now and struggle with bank transfers from abroad so am very interested in Fabpay. Please send me details as soon as possible. Will I have to join another payment scheme? We will be launching FabPay in the next few weeks, it will be a cost effective way to process credit cards and you will not be tied in or have any monthly bills. It is a pay as you go service designed for accommodation providers. I’m very confident it will be a good service for you. As soon as its ready we will be emailing all our customers.